British Prime Minister Theresa May has warned MPs to approve her Brexit deal on the third attempt or face delays in leaving the EU. One of her ministers says a "significant number" of colleagues now support the plan. British Prime Minister Theresa May has warned dissenting lawmakers in her ruling Conservative party to back her Brexit deal during a third parliamentary vote — likely to take place this week — or the country will have to take part in the European Parliament election in May. 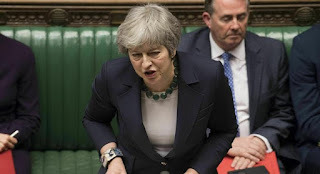 Writing in the Sunday Telegraph, she warned that if the UK parliament can't agree to the deal by March 21, the first day of the European Council summit, Britain would almost certainly face a lengthy delay in leaving the European Union. May said "we will not leave the EU for many months, if ever." "The idea of the British people going to the polls to elect MEPs three years after voting to leave the EU hardly bears thinking about. There could be no more potent symbol of parliament's collective political failure," she warned. During months of political deadlock, MPs have twice resoundingly rejected the EU-UK withdrawal agreement, which took 18 months to negotiate. Lawmakers also voted last week to seek to postpone Brexit, and also ruled out a disorderly withdrawal from the EU on the scheduled exit date of March 29. British media reports suggest some Euroskeptic lawmakers may reluctantly be prepared to vote for the Brexit deal, amid concerns about any delay to Britain's departure or even a second referendum, which could overturn the decision. Former Cabinet minister Esther McVey, who resigned over the Brexit agreement, told Britain's Sky News on Sunday that she would back May's deal now because "the choice before us is this deal or no Brexit whatsoever." If May wins that parliamentary approval, Britain's departure from the bloc can likely take place with just a "short technical extension" beyond March 29, the British leader said. May also needs the support of Northern Ireland's Democratic Unionist Party, whose 10 lawmakers give her government a parliamentary majority. Reports suggest the DUP maybe closer to supporting the deal. Two of her top ministers, however, warned that May might not even submit her deal for a third vote unless she secures sufficient support from rebel Brexiteer MPs. "It would be difficult to justify having a vote if you knew you were going to lose it," International Trade Secretary Liam Fox told Sky News on Sunday. "We will only bring the deal back if we are confident that enough of our colleagues... are prepared to support it so that we can get it through parliament," finance minister Philip Hammond told the BBC. Hammond admitted that the government did "not yet" have the numbers to win, but said a "significant number of colleagues" have changed their view. Opposition Labour party leader, Jeremy Corbyn, meanwhile, told Sky News he would back a proposal to hold a public vote on the Brexit deal if it gets parliamentary approval. Corbyn has long been under pressure by members of his party to back a second referendum, or People's Vote, on Britain's EU membership but fears alienating those Labour voters who backed Brexit. Polls show the public remains as split about Britain's place in Europe today as they were during the referendum un June 2016. Most show the pro-EU camp ahead by a few percentage points.